For King Solomon, who reigned for forty years, old age yields the rewards of a life well lived. “Old age is a crown of dignity, which is found in the ways of justice,” he says in Proverbs 16:1. The King’s words suggest the importance of preparing early to enjoy those serene, comfortable years after retirement. Yet, according to a number of recent surveys, most Americans fail to plan realistically for retirement. Many people responding to a recent survey on their retirement plans said they expected to work well beyond retirement age. Although the majority of these individuals were working in fields where retirement isn’t mandated – as business owners, academics and professionals in law and medicine – unforeseen circumstances can derail that plan. An unexpected health problem, changes in economic conditions, or even a change of heart about the whole thing can mean a need to fall back on retirement income. Others, nearing retirement with limited savings, think it’s just too late to try to create a better income stream. These folks may be relying on an employer’s pension plan or Social Security to fill in the gaps. Some may have a retirement savings account without much in it. But financial experts say it’s never too late to start planning. And for those who can manage it, investing in real estate or becoming an entrepreneur may provide a solution to creating income in retirement. 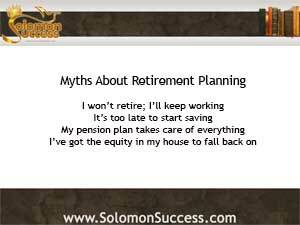 There are other myths about retirement savings, too. People may simply miscalculate the amount needed for a comfortable and prosperous retirement. Anticipating needs, as well as the volatile nature of the economy, may be difficult. But in today’s world, people can expect to live a third of their lives – or maybe more – post-retirement. That’s a long time – longer than many realize. Of course, these myths about retirement are not really myths. There’s truth in them all. But as Solomon advises, wisdom and prudence can lay the foundation for a comfortable and prosperous life post retirement. The key is to take active steps to ensure a secure income stream. Investing in income property as a real estate entrepreneur, as Jason Hartman advises, can lay the foundation for that kind of income stream, allowing retirees to enjoy life with that crown of dignity the King describes.